There is something beautiful about two stoners in love, especially when they’re running for their lives from the CIA. Part action-comedy, part romance on the rocks, American Ultra is a late summer treat that features a little bit of everything that makes movies fun. Jesse Eisenberg stars as Mike Howell, an assuming pot head who can never seem to leave the quiet West Virginia town he calls home. The only thing he cares about in the entire world is his girlfriend, Phoebe (Kristin Stewart), who lives to be with Mike. Their lives are simple, if not a little too mundane, but they are soon flipped upside down when the CIA decides Mike needs to be executed. What Mike doesn’t know, but soon comes to realize, is that he possesses a very special set of skills he has long forgotten how to access. He’s actually a sleeper agent for a program that no longer exists and he’s now set to be terminated, but thanks to a little help from a friend he doesn’t remember he’s given a chance to fight for his survival. With his memory slowly returning, Mike and Phoebe must face off against a team of maniacal assassins and find a way to save their own lives before the CIA catches up. Eisenberg and Stewart’s onscreen romance finds a more intense version of the same spark that made Adventureland pop. The entire film lives and dies on the bond their characters share, and they each do a great job of bringing something unique to their part. The supporting cast is nice as well, with Connie Britton leading the charge as the funniest amongst the second tier of talent. She’s underutilized as ever, but every scene she receives is one you’ll remember. The same can also be said for John Leguizamo, whose turn as an n-word dropping drug dealer is almost too bizarre for words. Nima Nourizadeh could have taken Max Landis’ script for American Ultra and given it a grounded, straightforward tone a la Pineapple Express, but instead he allows the characters and their exploits to flourish in their own unique and zany ways. It’s a risky move, especially for a film trying to balance stoner humor with high-concept spy stuff, but thanks to quick pacing and an impressive cast he’s able to make it work. That said, it’s hard to shake the notion that the film could have been even better had it been entrusted to someone with a more keen eye for the world of action. Nourizadeh’s only other directorial credit is the frenzied party film Project X, and it’s clear on this project his skills behind the lens haven’t evolved much, if at all, since that film was released in 2012. 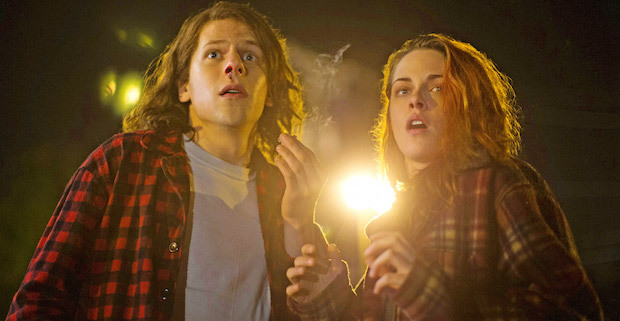 Those shortcomings aside, American Ultra is a deliriously fun romp through rural West Virginia that will leave you begging for more adventures with Mike and Phoebe. I doubt a film like this will ever warrant a sequel, but the film lays more than enough groundwork to launch a full stoner-spy franchise if so desired by the studio. Regardless of whether or not that happens, American Ultra serves as proof the stoner comedy genre is far from dead. In fact, it may be more alive now than ever before. With legalization quickly spreading, tales of everyday stoners doing superhuman things could very easily become a popular movie trope, and I, for one, would not complain one bit.